I love reading quotes. Especially German Shepherd quotes. And that is all this page will be about - quotes about GSDs, quotes made by famous people in the German Shepherd universe such as Max von Stephanitz quotes, and other quotes I find all about these amazing dogs. So enjoy and read on and just see what you find since this will be an ever evolving page. I seriously think you'll find many different quotes here that you'll truly love. And if you know of any I haven't posted yet, please submit them using the form below and I'll add them for sure. 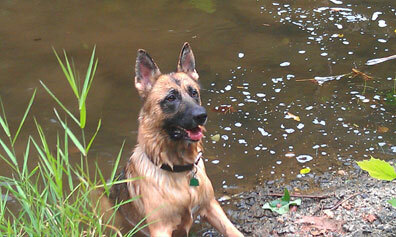 The coloring of the dog has no significance whatever for service; our shepherd dog accordingly is not bred for color. Coloring therefore is only a fad of the amateur and as such is often liable to changes of whim. Take this trouble for me: Make sure my shepherd dog remains a working dog, for I have struggled all my life long for that aim. The breeding of shepherd dogs is the breeding of working dogs; and this must always be the aim, or we shall cease to produce shepherd dogs. The dog essentially thinks through his nose. Even the most perfectly built dog is of no use if he does not possess the incentive to give of his best and of his uttermost. The impulse for work is born in our dogs. The dog who is kept in the kennel...is no better than a beast caged for show. The working dog is trained to be very smart on the word of command, but he learns to understand very much more beyond it, if only his master will take the necessary pains with him. Show me your dog, and I will tell you what manner of man you are. A good dog observes his master so closely that he almost knows him better than he does himself, and he must often indeed wonder that the reverse occurs so rarely.